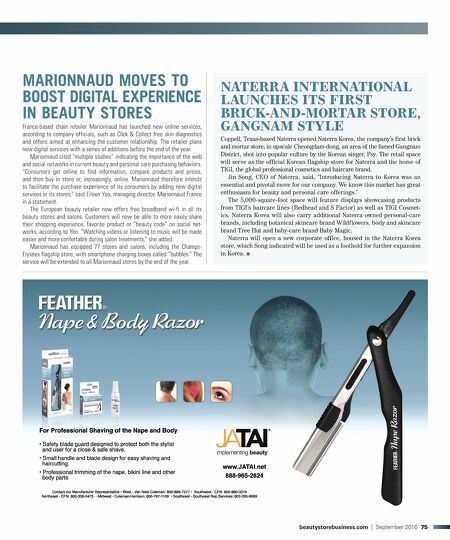 74 September 2016 | beautystorebusiness.com News Fantasia Industries Corporation Available at Fine Beauty Supply Stores & Major Retailers FANTASIAHAIRCARECOMs-ADE)N53! @ICFantasia Fantasiahaircare FANTASIA INTRODUCES A NEW AND BETTER 100% NATURAL JAMAICAN BLACK CASTOR OIL 7YVTV[LZ/LHS[O`:JHSW /`KYH[LZ9LSPL]LZ+Y`:JHSW 7YL]LU[Z)YLHRHNL :[YLUN[OLUZ/HPY /UROILISCERTIlEDPUREANDNATURAL7EARE STANDINGBEHINDOURQUALITYASASUPERIOR GRADEOILTOOUTPERFORMALLTHECOMPETITORS Fantasia's Jamaican Black Castor Oil PROVIDESTHEOPTIMUMCONDITIONINGFORDULL HAIRANDDRYmAKYSCALPS Fantasia is known for over 50 years for its 1UALITY)NTEGRITYAND6ALUE NO (3*6/63:<3-(;,: 7(9(),5:7/;/(3(;,: SHOP! MASTER'S RETAILING PROGRAM OPENS FOR REGISTRATION A two-day, "intensive training" course by retail trade association Shop! is set for Oct. 4-5 in Chicago, according to a spokesman. The 2016 Master's Program is a fast track course for earning the Marketing at Retail Certification (MaRC), added the spokesman. Taught by industry leaders, the intensive two-day curriculum covers a range of topics from sales promotion planning and in-store creativity to understanding consumer behavior. Shop! (formerly A.R.E. | POPAI) has been offering certification programs for 20 years. The curriculum is designed for anyone new to the industry who wants to gain familiarity with the POP business or for those wishing to enhance their knowledge. Participants also have the opportunity to network with peers and talk one-on-one with industry experts from higher-education institutions, brands and retailers. Speakers include Simon Cartey, vice president of Store Planning & Design at Toys "R" Us, who will lead a keynote session on day two: Thinking Inside The Box—How Innovative Design is Shaping the In-Store Shopping Experience. The keynote speaker for day one is James Fraser, SVP, general manager U.S. at Hunter Straker. Fraser will cover ways to succeed in the new performance economy. Scheduled speakers and topics also include: Neil Stern, senior partner, McMillan Doolittle: Greentailing on a Global Scale; Adrian Pynenburg, president, Connect Oasis: Tech Solutions for Calculating ROI; Leslie Boyajian, CMO, Augment: Emerging Tech at Retail; Terri Albert, PhD. principal, Fresh Set of Eyes, LLC: Discovering New Opportunities-Driving Outcomes; Joe LaGrow, North American sales manager, Underwriters Labs: Managing the Risks Associated with Point of Sale and Retail Fixtures; Leo van de Polder, general manager, POPAI Benelux: Shopper Journey: How to Convert Shoppers to Buyers; Evelijn Vissers, consultant and trainer Q&A Consultancy, an Ebeltoft Company: Store of the Future; Angela Singer, project marketing manager, Augment: Retail Display Design and Marketing with Augmented Reality. Participants earn 18 credits toward the 27 required for certification, according to the Shop! spokesman. To register, visit shopassociation.org. 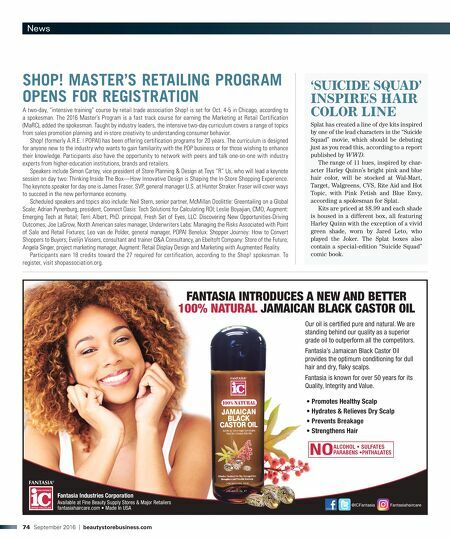 'SUICIDE SQUAD' INSPIRES HAIR COLOR LINE Splat has created a line of dye kits inspired by one of the lead characters in the "Suicide Squad" movie, which should be debuting just as you read this, according to a report published by W WD. The range of 11 hues, inspired by char- acter Harley Quinn's bright pink and blue hair color, will be stocked at Wal-Mart, Target, Walgreens, CVS, Rite Aid and Hot Topic, with Pink Fetish and Blue Envy, according a spokesman for Splat. Kits are priced at $8.99 and each shade is housed in a different box, all featuring Harley Quinn with the exception of a vivid green shade, worn by Jared Leto, who played the Joker. The Splat boxes also contain a special-edition "Suicide Squad" comic book.